Aliyu Abubakar Aziz, the director general of the National Identity Management Commission (NIMC), says the mandatory use of the national identity number (NIN) will begin in January 2019. 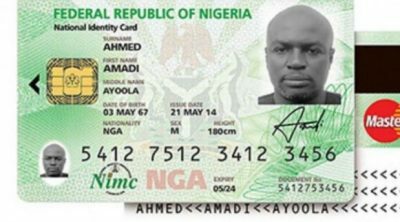 In a statement released on Tuesday, Aziz said the federal executive council (FEC) approved the immediate implementation of a roadmap for a new digital identity ecosystem for the enrolment of Nigerians and legal residents into the National Identity Database (NIDB). “The FEC’s approval of the new Digital Identity Ecosystem will bring into full force the implementation of the provisions of the NIMC Act 23, 2007, which include the enforcement of the mandatory use of the National Identification Number (NIN) and the application of appropriate sanctions and penalties on defaulters as provided under Section 28 of the NIMC Act,” the statement read. Aziz said the NIMC act gives the commission the power to set a date for the enforcement of the use of NIN for eligible transactions. This means only data captured as of 30th November 2018 will be subjected to harmonisation.